From left to right - Captain Vanselow; Count A. Oberndorf; General Winterfeldt; Capt. J.P.R. Marriott; Herr Erzberger; Rear Admiral Sir George Hope, K.C.M.G. ; Admiral Sir Rosslyn Wemyss, G.C.B. ; Marechal Foch and General Weygand. Label on back reads: Humphrys, W. Frank Gadsby LTD.
Thrale Galleries, 326-328 Streatham, High Road S.W.16. 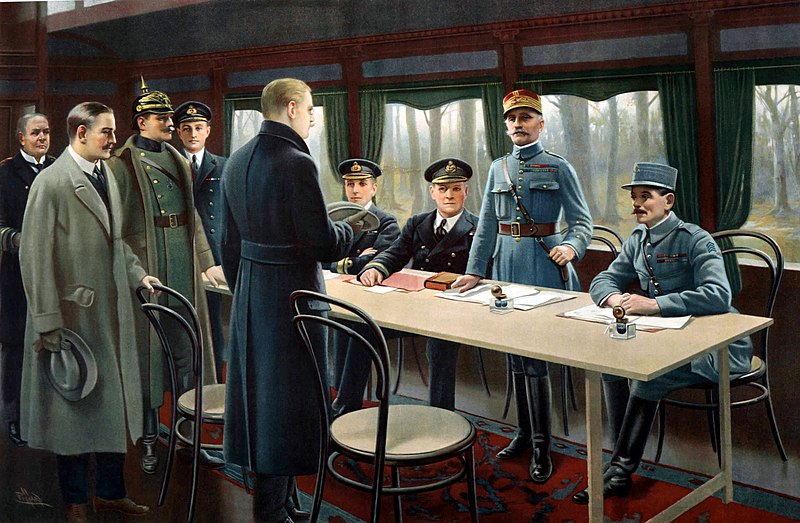 The Armistice, which ended WW1, was signed in a railway carriage in the forest of Compiegne, France. We have not yet traced the present location of the original painting but it came up for auction in 2017 at the DuMouchelles Art Gallery in Detriot, USA. Harold Hume Piffard, known as Piff, was a prolific artist, illustrator and aviator. He was educated at Lancing College where he had aspirations to become an actor, absconding from school at the age of 12 and walking to London to get employment in the theatre or music hall...without success. On leaving college in 1884 he travelled to India, where his barrister father, Charles Piffard, had been born and had strong ties. Harold worked on a tea plantation before returning to England where, in 1889, he entered the Royal Academy School. He also studied in Paris. In 1895 he exhibited his first oil painting at the Royal Academy. He exhibited on two other occasions at the Royal Academy as well as exhibiting at the Walker Gallery in Liverpool and The Royal Society of British Artists in Birmingham. He painted a wide range of subjects including portraits, historical, military and domestic scenes. His career in illustrating began in 1894 and over the years he illustrated many books, magazines and periodicals, working for many illustrious publishers. Whilst at the peak of his career he began developing an interest in aviation, designing and constructing model aeroplanes before building full size ones around 1910 and flying them short distances himself. He rented a field at Shoreham, which became the Shoreham and Brighton Aerodrome; the first airport in the UK to be granted a commercial licence. For someone as prolific as Piffard, as both a painter and an illustrator, it is surprising that he is not better known. His paintings do come up for auction and command good prices.